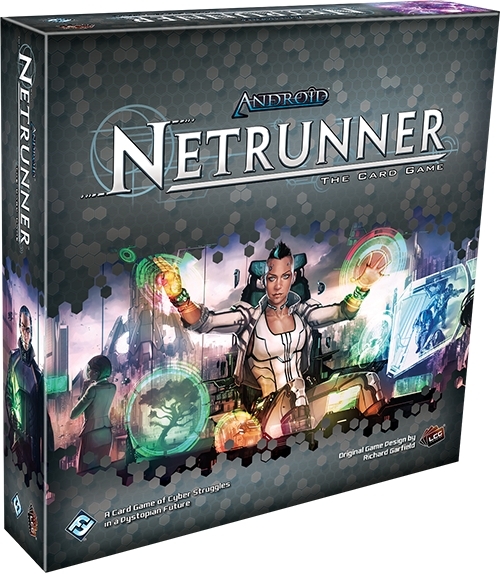 Now is a great time to jump into playing Netrunner. Well, not quite yet. We’re still waiting for the release of the new core set but that should be in a few months. I like Netrunner. For a two player game the LCG is an amazing strategic deck builder, paired with resource management through actions and economy, and it’s asymmetric to boot. It really is a great game. However over the years the number of expansions that have rolled out can make getting into Netrunner daunting. Part of this has been alleviated with rotation. In brief, expansions are released in cycles sets of cards. After a certain number of cycle releases, the oldest cycle expansions will ‘rotate out’ of the game for tournament play. This shakes up the competitive game some and keeps from having a card pool of 5+ years floating around, making the buy in for new players almost insurmountable for the tournament scene. One caveat to the whole rotation thing is that a few expansions (commonly referred to as big box expansions) are evergreen products. These expansions are exempt from rotation. Like the core set cards, they will always be available for players to use in tournaments. But the new core set is a big deal. Not so much for the cards they are putting into the game but the ones being taken out, retired from the game forever. There was some chaff in the core set. Some cards likely had big plans originally for being integral parts of the game, but never really went anywhere. Other versions rolled out over the years that were just better in every way to core set choices (I’m looking at you Access to Globalsec). So an opportunity to cull some binder fodder cards from the core is great. I haven’t had much of a chance to play through updated core set decks. I did play mash decks with the original core set thoroughly though (offhand about 20 or so total games through all the factions). What I mean by mash decks here is gathering all the cards for one faction and their respective neutral sets, mashing them together into a deck, and playing (which is recommended for initial games). I lost a lot playing these types of decks. Rumors abound were that corp decks made this way were neutered some in order to push the concept to runner players that they need to be making runs. That key action is what the game is all about. Granted it wasn’t real deck building but it did allow me to effectively learn the cards and begin to see what gaps and advantages certain factions had. Offhand, even though poorly optimized, I feel the new core offers a better game experience with these type of mash decks. Aside from some weak ability cards within the old core set, you also had absolutely stellar ones. It’s one point I worry some regarding the future of Netrunner, that power creep might seep into the game. We might get some cards in expansions that surpass the revised core set (and evergreen expansions) in every way, making it almost a requirement that new players have to buy into all the available expansions to be competitive within the tournament scene. That was one solid thing about the old core set. Some cards were staples for competitive decks, even after years. I’m going to try and stay positive for now. Honestly though we have to admit that many old core set cards were so efficient, so versatile, and were key parts to such powerful combos, they almost broke the game. Yog.0 and Corroder were amazingly efficient breakers. So much so that, like the Criminal console Desperado, not only were they common in many decks, but set the bar so high for cards that followed almost nothing could match them. And if attempts were made to make something equitable, they’d likely introduce such a broken card it’d have adverse effects on the competitive scene. Some cards like Parasite provided an interesting mechanic of grinding down ice and eventually destroying it completely. As a limited card, it was a game element that offered avenues for some interesting play. However it could also mushroom into some insane combos. Sifr was a console released later that is pretty powerful, yet with Parasite it morphed into an ice destruction machine. Throw in another core card, Déjà Vu, and you now had the potential to demolish 13 pieces of ice over a game, a combo being completely out of whack. Scorched Earth, a staple card for tag and bag type of decks is also no more. That potential for tagging and flatlining runners is still out there, but harder to pull off. And with having a card like Scorched Earth being removed from the game, clearly is indicating the win condition of flatlining the runner is shifting over to more interactive mechanics. This doesn’t encompass all the key strategies and deck types that the core set provided (not to mention 3 IDs for the game also being retired). What I want to illustrate though is that these cards being removed from the game have a huge impact on current competitive decks. This really shakes things up. Take any old podcast talking with authority about core standard cards for particular factions, or a plethora of published deck lists, and throw them away. They’re pretty much irrelevant now. That is how much impact this new core set has on the Netrunner scene. I’ll quickly mention another big aspect of new cards moving into the core set are the inclusion of 3/2 agendas. Every corp now has access to 2 point agendas that only need 3 advancement tokens. That’s a pretty big shift in the game. As they will never rotate out they’ll likely have some wide reaching repercussions to Netrunner overall. So if buying in right now are the old core sets worth it? A tough call. A fair chunk of cards are literally trash. Along with this are a good number of cards in the first two expansion cycles that are rotating out. Some will be shifting over to the new core set and still be usable. This reddit comment nicely gathers which expansion packs have cards that will be legal with the new core. But consider most expansion packs will be about $12-16 USD for roughly 20 unique cards with 3 copies of each card. For the current core set, you are losing a chunk of cards too. I’d go with waiting and only consider picking up an old core set if you could get it dirt cheap. Consider the data packs as a decent yardstick for comparative pricing (so $25 USD for an unopened original core isn’t bad). Same with the old data packs. There are so many being rotated out, you are likely better off getting 2 copies of the new core set rather than collecting the entire first 2 data pack cycles. But if you only want to purchase a pack or two? It might be worth buying those packs then. I’ll complain some here now. Yes, the new core sets appear more playable out of the box for people to pair off against each other. But it’s still saddled with an incomplete distribution of cards. So much so you’ll probably want a second core set at some point if delving deep into tournaments. As a casual player, that money would be better spent in getting evergreen, big-box expansions (especially Terminal Directive which is a solid expansion purchase). Regardless if Netrunner looked like an interesting game, now is the time to get into it. New players can jump in and enter the game with a more even footing compared to long time players. Not only is rotation hitting, but also this new core set. Everyone is learning novel things about the game and exploring new options. It’s far more dynamic that what we’ve seen in the past. This new core set has shaken up the established game and it’s wonderful. 28mm Russian heavy weapons teams – Plastic Soldier Co.